My daddy always carried a pocket knife. No true southerner (nor midwestern country boy, which my father was until he moved south) would leave home without it. That pocketknife came in handy for so many practical things: opening a cold can of beans on a camping trip, stabbing and eating bites of food when someone forgot the utensils on that very same camping trip, opening a can of paint, peeling an orange picked fresh from the tree, cutting a small tree branch to use on a wayward kid’s behind…and even cleaning fingernails and toenails in a pinch. Once my dad famously cleaned his fingernails with his pocketknife and then proceeded to slice and eat a juicy, ripe peach with the same knife, stopping only for a quick brush against his blue jeans in between. He did the fingernail/food thing more than once while I was growing up. Of course, always in the presence of kids or grandkids–in order to enhance the shock value–as teasing of that sort gave my dad loads of joy. As my brothers came of age, they each were given their own pocketknife, a baton of manhood passed from father to son. My dad–who grew up in the backwoods of Missouri, attained an engineering degree, and eventually became a real estate broker–never lost his charming country boy ways nor forgot his humble roots. 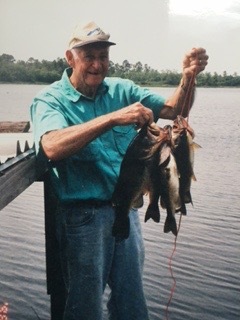 He was hard-working, outgoing, and loved the outdoors…continuing to hunt out west with his brothers well into his 70’s. Among my dad’s things when he passed away at 80 years old, was his trusty pocketknife, a symbol of who he was as a husband, a father, a man…practical, loyal, industrious, outdoorsy…just a country boy with his pocketknife. I love you dad and miss you. Can’t wait to see you again at heaven’s gate! This entry was posted in Spiritual Encouragement and tagged daughters, family, Fathers, sons. Bookmark the permalink.